NEW YORK - U.S. stocks extended their steep losses Friday after a mixed U.S. jobs report left investors uncertain about the outlook for the Federal Reserve's interest rate policy. While the steady hiring could encourage the Fed to raise interest rates for the first time in almost a decade later this month, some economists think that a sharp economic slowdown in China could prompt policymakers to keep rates low. The U.S. markets are closed on Monday in observance of Labor Day. However, the Chinese stock market, which has fueled investors' anxiety with big swings recently, will reopen after a two-day holiday. 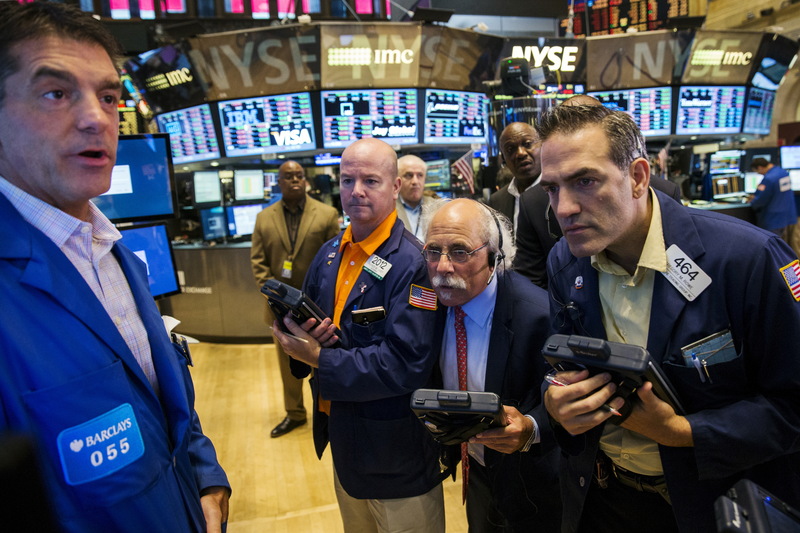 The Dow Jones industrial average finished the day down 272 points, or 1.7 percent, to 16,102. The Standard & Poor's 500 index gave up 30 points, or 1.5 percent, to 1,921. The Nasdaq composite slipped 50 points, or 1 percent, to 4,684. Trading volume was lighter than usual ahead of the holiday. U.S. employers added a modest 173,000 jobs, but there were upward revision in jobs gains to the previous months. The unemployment rate also fell to 5.1 percent, its lowest level since March 2008. The report will be a key factor as Federal Reserve officials decide whether to raise rates for the first time since 2006. "Like so many (reports) that we've seen lately, it doesn't, by itself, make a definitive case for raising rates in September or December," said Paul Christopher, head global market strategist for Wells Fargo Investment Institute. "We've really never seen a time when Fed policy has been so uncertain." The stock market remains volatile after slumping in August, when it logged its worst monthly performance in more than three years. Stocks plunged on Tuesday after gloomy economic data out of China rekindled fears that the world's second-largest economy is slowing much faster than anticipated. The S&P 500 is headed for a loss of 3.6 percent for the week, which would be its second-worst weekly drop of the year. In Europe, the FTSE 100 index of leading British shares was down 2.4 percent, Germany's DAX fell 2.7 percent. The CAC-40 in France was 2.8 percent lower. Bond prices edged up after the jobs report, pushing the yield on the benchmark 10-year Treasury note down to 2.12 percent from 2.16 percent on Thursday. The euro edged up to $1.1145. The dollar fell 1 percent against the Japanese currency, to 118.94 yen. Japan's Nikkei 225 fell 2.1 percent, South Korea's Kospi dropped 1.5 percent and Hong Kong's Hang Seng fell 0.5 percent. Benchmark U.S. crude oil fell 70 cents to close at $46.05 a barrel on the New York Mercantile Exchange. Brent Crude, a benchmark for international oils used by many U.S. refineries, lost $1.07 to close at $49.61 a barrel in London. The price of gold fell $3.10 to settle at $1,121.50 an ounce, silver fell 16 cents to $14.54 an ounce and copper declined seven cents to $2.32 a pound.